How much “structure” do you need in an organization? This is one of the eternal debates in the field of management & organization. Unfortunately, the debate is often based on ideology and personal preferences. One example is the movement that advocates an organizational form called “holocracy”, which is a concept for an organization without bosses. This idea has received a lot of attention (see here for one example). But shouldn’t we start by trying to understand the challenges facing a particular organization, before recommending a solution? In my work as a consultant, I do find that some organizations are “overspecified”, that is, that they rely too much on hierarchy and formal procedures. For example, I have observed this in some public sector organizations. Those who work in such organizations are supposed to be aware of – and comply with – a large number of guidelines, procedures, regulations when carrying out their work. Their roles and duties are typically highly formalized (i.e., specified in writing); decision making authority is often centralized; and there are several layers from the bottom to the top of the pyramid. But in many other organizations that I work with, the opposite is the case. People in these organizations complain that they don’t know what their role is or what they are responsible for. Work processes are ad hoc or informal – or highly political – even in cases where everybody would agree that it would be fairer and more effective to have a formal, standard way of performing them. In such organizations, people may participate in a lot of discussions, but nobody seems to have the authority to make a decision (let alone follow through and implement it). People can’t make choices and set priorities because they don’t know what the overall direction of the organization is. In the words of author Stephan Haeckel, “They feel like they are on board a rudderless ship that is drifting at sea”*. Such organizations are “underspecified”, that is, they lack leadership, structure and governance. Of course, most organization would fall somewhere in the middle of such a continuum. But the point is that one has to find out where on the continuum one is, because the solution – if one wants to become more effective – is radically different. We also need to understand the particular external demands facing the organization. A bank, for example, typically is on the extreme end of the continuum, with a lot of focus on formal processes. But I am not saying that the business environment determines everything. In some cases we do observe that an organization is indeed overspecified. And that people in the organization believe that this is a real obstacle to increasing effectiveness. If so, we should of course try to introduce more flexibility and more informal ways of working. We may try, for example, to reduce the number of detailed specifications of policies and procedures, and instead focus on outcome-oriented goals. This will reduce the number of rules and provide employees with more autonomy in selecting the course of action to take to reach the goal. But if the organization is underspecified, we need to follow a different approach. Depending on the situation, the right intervention may involve clarifying unit mandates and defining individual accountabilities, introducing some standards for how to perform key work processes, establishing basic principles for decision making, or re-organizing people into a new reporting structure with a more logical grouping. *The phrase is borrowed from Stephan Haeckel’s excellent book “Adaptive Enterprise” (HBS Press, 1993). I like your challenge of the commonly agreed “truth” that every organization is over-structured and should therefore be made more flat, have fewer standard procedures. I like it because all such “truths” that “everybody seem to agree to” should always be challenged and tested. I would like to add to your article that one crucial area that is severely under-structured is the the leader’s job deliverables. Most organisations define leadership competencies. However, a competency is not a “deliverable” just as knowing how to read music does not mean that I can sing. Thanks for yout comment, Karin. Yes, agree that leadership deliverables also may be underdefined (for senior executives, though, I would expect these to be relatively ill defined by definition almost, but you may have an answer to that!). To be able to answer the question you put, Three things comes to my mind. Firstly; Break down the problem. It is impossible to answer a question like this on such a general level. Is it related to specification of Organization structures or job roles? Is it related to policies or Directives? Is it related to Business Processes? Secondly; It is from short feed-back loops in the real world of activities in an organization you will find if ways of working (Management System) is overspecified or underspecified. If the management and staff in a specific part of your operations lack support or are hindered by the structures defined, they should as fast as possible either have the Power to change them or report this back to who ever is responssible. Thirdly; Search for performance messures. Monitor Performance. If there is problems, take action. One problem may be overspecified or underspecified organizations. Dont start in the other end by “counting number of pages”. I certainly agree that one should break down problem, when considering how to improve a real organization. My main message was mainly that one can err on both sides and that the approach that one takes needs to be based on a diagnosis of the current organization (and the goals/strategies for the future) rather than prescriping one solution (e.g., “remove all bosses”). Thank you for this thinking! I find your lens of over- vs under-specification very useful to analyse client situations and come up with interventions to improve the organisation. Maybe the solution is a good balance of specification — over AND under? Most organizations we deal with are not over or under specified, but a little bit of both — they contain both the hierarchy and the networks. Often just a tweaking of the networks is all that is required to increase collaboration and innovation. Thanks for your comment Valdis. Will look at the article you provided a link to. 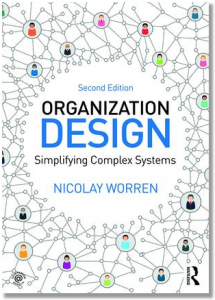 I agree that organizations contain both hierarchy and networks, but the question for an org. designer is whether the hierarchy is well designed, and whether the social networks actually support the organization’s strategy/intentions/functions.